Improve students’ music performance through assessment. A. Concert Group Events: WSMA Concert Group events include four levels of classes – A, B, C and M.
B. Solo & Ensemble Events: WSMA Solo & Ensemble events include three levels of classes – A, B and C.
C. Classes Defined: Classes are based on approximate years of experience on a musical instrument/voice. Comment: The determination of events selected and class level chosen is at the discretion of the member school teacher utilizing the guidelines as stated above. It is strongly recommended that students in grade 6 begin the Solo & Ensemble experience in Class C.
I A consistently outstanding performance in all areas. II A very good performance with only minor issues. III A performance demonstrating accomplishment but weak in several qualities. IV A performance containing numerous weaknesses within the performance. Teachers may choose to register any festival event as Comment Only (CO). If CO is indicated, the adjudicator will provide written and verbal feedback, but no rating will be indicated. The overall rating will be reported as CO.
Ratings are posted on site at every festival. Some district festivals also post ratings online. All WSMA State Solo & Ensemble ratings are posted online following the completion of the festival. Comment: Each adjudicator is allowed to select a limited number of Exemplary Soloists from the WSMA State Solo & Ensemble Festival. Selected students receive a certificate of recognition from WSMA. A limited number of these students are invited to perform at the Wisconsin State Music Conference in October. Comment: Concert groups that have 5th grade students regularly participating with 6th grade (or older) students may also include 5th grade in a Concert Group Festival or Concert Group Clinic Experience. There is a schedule conflict with an academic class required for graduation. Enroll in and complete an independent music class. Participate in a school music ensemble that rehearses regularly throughout the school year. Serve as a coach (tutor/peer coach) for other music students. At the discretion of the member school, piano students who are not members of a school concert group may participate in a WSMA Solo & Ensemble Festival. Comment: WSMA recommends that the piano student be enrolled in a school performing ensemble or asked to accompany at least one solo or ensemble event. Payment of an annual enrollment fee to WSMA. Payment to WSMA of Solo & Ensemble registration fees as outlined in the Schedule of Dues and Fees found on the WSMA website. An ensemble can only be formed with other students that either attend a WSMA member school or are registered as non-WSMA member participants. Comment: Parents of non-member students should contact WSMA for additional information. WSMA Music Festival Rules and Information govern all WSMA sanctioned festivals and are intended for use by member schools. WSMA allows individual schools to adopt additional policies and expectations as an extension of the rules and information stated below. Additional event-specific rules and requirements are listed in the event headers found in the WSMA Festival Music List. Any violation of a WSMA festival rule on the day of the festival will result in the performance receiving a critique only (no rating). No event will be prevented from performing for violation of a WSMA festival rule. A second performance is not allowed under any circumstances. If there is a discrepancy between the printed WSMA Festival Music List and the online version, the online version takes precedence. At least three member schools are required to form a WSMA District Concert Group Festival. Concert festivals will be assigned three WSMA adjudicators or two WSMA adjudicators and a clinician of the festival manager’s choice. Comment: Non-WSMA clinicians should use a Comment-Only rubric (available in MyCenter>Concert Festival) or another form to record comments. A subsidy amount based on registration fees as approved by the WSMA board is sent to the festival manager after WSMA has received all payments from participating schools in the concert group festival. Comment: WSMA assigns all adjudicators, collects fees, implements rules, provides a subsidy and offers awards to purchase for concert group festivals. All Concert Group Festival events must be registered online via MyCenter at least four weeks prior to the Concert Group Festival. Concert group festival managers have the option to deny late entries. If a late entry is permitted, an additional cost per entry applies. No refunds will be made for the withdrawal of any entry within four weeks of the festival. Sight-reading is not required; however, directors may request a sight-reading experience as part of the concert group festival. Comment: The festival manager must provide a sight-reading experience if time and space are available. Concert groups requesting to sight-read must submit an additional fee as outlined by the Dues and Fees Schedule (available at wsmamusic.org/fees/ ). All WSMA Concert Group Festival events are open to the public. Except for the optional sight-reading event, it is not appropriate to clear any room prior to or during a performance. The recording of the adjudicators’ critique or clinic is not permitted under any circumstance. The recording of the student performance is at the discretion of the parent and/or teacher but must be in accordance with federal copyright laws. Each concert group must perform one selection from the current WSMA Festival Music List. Each concert group must perform two additional selections, for a total of three. If the combined performance time equals or exceeds the minimum times listed below, a concert group may perform only two selections. Concert groups that perform one multi-movement selection from the current WSMA Festival Music List that meets the minimum time requirement should perform another short selection. Teachers may adapt music to accommodate students identified with special needs (i.e. 504 or IEP). All adapted music and requested accommodations must be submitted to WSMA using the Permissions Request Form (available at wsmamusic.org/permissions). Students or adults may perform published accompanist parts for choral groups in a WSMA Concert Group Festival. Pre-recorded, taped, or sequenced accompaniments are not permitted for concert group festivals. The adjudicator(s) must be provided with a complete score of all music to be performed. The required selection must be the matching, correct edition. All choral scores must be original or legal electronically printed music. Instrumental scores may be photocopies for the adjudicator(s). Label all scores with school name, class entered, and director’s name. The numbering of measures is highly recommended, but not required. A brief pause between numbers is allowed and is at the discretion of the director. A student member of the ensemble is expected to introduce the performance, including school name, title of selection (and movements if appropriate), composer and a significant aspect of the selection (style, form, harmony, melody, rhythm or technique). Comment: The introduction does not need to be memorized nor is it part of the overall rating. Tips and resources for writing an introduction can be found online via MyCenter. Students are required to listen to a minimum of one other performing group and to evaluate the performance. Comment: WSMA has student listening forms available online via MyCenter or the director can use any listening form of his/her choosing. These forms are retained by the teacher and are not given to the performing group or sent to WSMA. Two or more schools may submit a request to WSMA to form a Co-op Concert Group providing all participating students attend WSMA member schools. Comment: The Co-op Concert Group Request Form is found online via MyCenter. All registrations are done online via MyCenter. Each member school is only required to pay one registration fee for multiple groups of the same type (from the same member school). All clinician arrangements and expenses associated with the clinic experience are the responsibility of the participating school(s). Comment: Directors are encouraged to contact WSMA if clinician suggestions are needed. Clinic experiences must use Concert Comment Only Rubric Forms (found online via MyCenter). No ratings are given or implied and no concert plaques are awarded. A minimum of 20 minutes of clinic time (not including performance time) must be provided for each performing group. The participating school(s) must scan and email the first page of the completed rubric form to WSMA within five days of completing the clinic experience. There is no minimum performance requirement for a WSMA Clinic Experience. It is suggested that groups follow the WSMA Concert Festival minimum performance requirements. Comment: Each group is strongly encouraged to perform at least one selection from the current WSMA Concert Group Festival Music List (Events 1000, 1010, 1020, 1030, 2000, 2010, 2020 or 3000). Students or adults may perform published accompanist parts for choral groups in a WSMA Concert Group Festival. Students are required to listen to a minimum of one performing group and to evaluate the performance. Comment: This could be a recording if a live listening opportunity isn’t available. WSMA has student listening forms available online via MyCenter or the director can use any listening form of his/her choosing. These forms are retained by the teacher and are not given to the performing group or sent to WSMA. Any violation of a WSMA festival rule on the day of the festival will result in the performance receiving a critique only (no rating). No event will be prevented from performing for violation of a WSMA festival rule. A second performance is not allowed under any circumstances. At least three WSMA member schools are required to form a WSMA District Solo & Ensemble Festival. All WSMA District Solo & Ensemble Festivals with Class A entries must take place at least three weeks prior to the assigned WSMA State Solo & Ensemble Festival(s) for the participating schools. A subsidy amount based on registration fees as approved by the WSMA board is sent to the festival manager after WSMA has received all payments from participating schools in a District Solo & Ensemble Festival. Comment: WSMA assigns all adjudicators, collects fees, implements rules, provides a subsidy and offers awards to purchase for district festivals. Supplementary income to support festival expenses may be generated by adding a surcharge to individual or class fees, offering concessions, etc. All supplementary income is at the discretion of the district. All WSMA District Solo & Ensemble events must be registered online via MyCenter at least four weeks prior to the district festival. District festival managers have the option to deny late entries. If a late entry is permitted, an additional cost per entry applies. No refunds will be made for the withdrawal of any entry within four weeks of a district festival. To transfer students to an alternate district festival, permission must be granted from the festival manager at the alternate festival site. Initial registration fees are not transferrable and must be resubmitted if the transfer request occurs after the registration deadline for the original festival or if the original festival is completed. Comment: All student transfers are completed online via MyCenter. All WSMA Solo & Ensemble events are open to the public. It is not appropriate to clear any room prior to or during a performance. The recording of the adjudicator’s critique or clinic is not permitted under any circumstance. The recording of the student performance is at the discretion of the parent and/or teacher but must be in accordance with federal copyright laws. Each soloist must perform one selection chosen from the current WSMA Music Festival List. Perform two contrasting movements on all multi-movement selections unless other instructions are specified. If the length of the music exceeds 3/4 of the allotted performance time, the music may be cut to stay within the time limits. Comment: If cuts are necessary, it is suggested that repeats and repetitive sections be cut first. Clearly mark all cuts in the music provided to the adjudicator. A student is required to perform a class A solo from Events 1111, 1121, 1211, 1221, or 1231 in a WSMA District Music Festival to enter and perform in music theater events 1311 or 1321. The adjudicator must be provided with a publisher printed original of the matching, correct edition of the music. The use of legal electronically printed music is also permissible. Public domain music (i.e. IMSLP) must be submitted through permissions as an alternate edition. Legally purchased e-print music should have “This music was purchased by (name) through (music publishers/website) or similar printed on the top of each page or on a separate cover page. If no statement or cover page is provided by the publisher, attach a proof of purchase. Performer and accompanist names, school name, title of selection (and movements if appropriate), composer and a significant aspect of the selection (style, form, harmony, melody, rhythm or technique). The introduction for music theater events 1311, 1321 and 1331 should include: performer and accompanist names, school name, title and composer of the selection. Instead of describing a significant aspect of the piece, students should establish the scene and given circumstances by describing the character signing and purpose of the song. The introduction does not need to be memorized nor is it part of the overall rating. Tips and resources for writing an introduction can be found online via MyCenter. Music theater introductions may be done in character or as a narrative. Memorization is required for music theater events 1311 and 1321. It is optional for all other events. Accompaniment is required for music theater events 1311 and 1321. It is strongly encouraged (but not required) for all other solos. Comment: Taped, pre-recorded, or sequenced accompaniments are permitted in all solo events including music theater. Alternative accompaniment instruments (i.e. guitar, harp, SmartMusic, etc.) may be substituted for piano. Students must perform different music at successive WSMA District Festivals. Each Regular Ensemble must perform one selection from the current WSMA Festival Music List. Comment: If cuts are necessary, it is suggested that repeats and repetitive sections be cut first. Clearly mark all cuts in the music presented to the adjudicator. A student may enter a maximum of ten (10) Solo & Ensemble events per district festival. Students may enter the same Regular or Special Ensemble event more than once as long as the selection and ensemble members differ for each entry. All participating students must attend WSMA member schools or be registered as non-WSMA member participants. The member school teachers of all participating students must approve the formation of the ensemble. Comment: The Co-op Special Ensemble Request Form is found online via MyCenter. Label all scores with school name and class entered. A student member of the ensemble is expected to introduce the performance, including performer and accompanist names, school name, title of selection (and movements if appropriate), composer and a significant aspect of the selection (style, form, harmony, melody, rhythm or technique). An ensemble whose membership remains substantially the same in the next year must perform a different selection than was performed at the prior district festival. Accompaniment (when applicable) is strongly encouraged but not required. 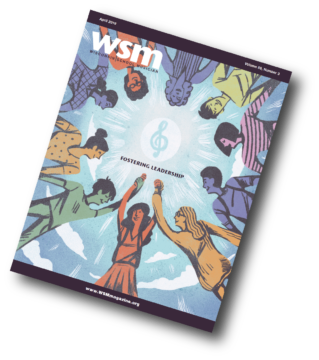 Comment: Taped, pre-recorded, or sequenced accompaniments are permitted for Regular Ensembles but are not permitted for Special Ensembles unless indicated in the WSMA Festival Music List Event Header. Alternative accompaniment instruments (i.e. guitar, harp, SmartMusic, etc.) may be substituted for piano in Regular Ensembles. *These events must perform for a minimum of 5 minutes or another selection must be added. Schools are assigned to a WSMA State Solo & Ensemble Festival site by WSMA. Comment: WSMA schedules all state festival events and assigns all adjudicators. Schedules are posted on the WSMA website. State Solo & Ensemble Festivals are held the last Saturday of April and the first Saturday of May annually. Each school’s assigned state site is listed on the WSMA website. Directors assigned to any state site may request that jazz ensembles, jazz combos, show choirs, vocal jazz ensembles or jazz improvisation solos perform at a Friday night State Festival. Requests to transfer all of a school’s state festival entries to another state festival site must be submitted to WSMA by November 15 of the current school year. WSMA retains the sole discretion to grant transfer requests, and may limit transfer locations based on space available at a given state festival site. Generally, requests will not be granted for schools that schedule another music event or tour on the same day as the assigned state festival. State festival transfer requests will be reviewed on a case-by-case basis. Any approved State Festival Transfer Request received by WSMA after November 15 will be assessed an additional fee per entry. All State Solo & Ensemble events must be registered online via MyCenter at least 15 business days prior to the assigned State Solo & Ensemble Festival. WSMA has the option to deny late entries. If the late entry is permitted, an additional fee per entry will be assessed. The late fee may be waived by WSMA if extenuating circumstances exist. No refunds will be made for the withdrawal of any entry within 15 business days of the State Festival. Student transfer requests for the WSMA State Solo & Ensemble Festival must be submitted online via MyCenter. Requests approved after November 15 of the current school year will be assessed an additional fee per entry. Transfer requests will be honored on a case-by-case basis. Time requests for the WSMA State Solo & Ensemble Festival must be submitted online via MyCenter. Time requests will be honored on a case-by-case basis. All WSMA State Solo & Ensemble events are open to the public. It is not appropriate to clear any room prior to or during a performance. To participate in a WSMA State Solo & Ensemble Festival, students must receive a starred (*) I rating in a Class A event at a sanctioned WSMA District Solo & Ensemble Festival in the same school year as the state festival. Individual students who qualify for state festival may enter a maximum of 10 (ten) total events per state festival date. Students qualifying in greater than ten events may transfer solo events to alternate state festival dates. Soloists may perform a different solo provided it is from the current WSMA Festival Music List (Class A) for the same event. No permission from WSMA is required. Jazz ensembles, vocal jazz ensembles, show choirs, contemporary a cappella and alternative string ensembles may perform a different selected number. The new selection must still fulfill the style requirement (or jazz ensemble swing tune requirement) as outlined in the WSMA Festival Music List Event Header.Comment: If selections/music performed at district required permission approval, the same permission approval letter is required for State Festival performance. Regular Ensemble members must be the same for both district and state festivals. Special Ensembles may perform at State Solo & Ensemble Festival for a rating even if all members are not present. In either case, substitutions are not allowed. The allowed number of events per accompanist at a district festival is at the discretion of the festival manager. The festival manager may choose to limit the number of events (or minutes) per accompanist to facilitate scheduling. The festival manager will contact schools/accompanists on a case-by-case basis if scheduling issues arise. The allowed number of events per accompanist at a state festival is at the discretion of WSMA. It is recommended that an accompanist not exceed twenty (20) accompaniments in a single State Festival weekend. WSMA will contact schools/accompanists on a case-by-case basis if scheduling issues arise. The WSMA Festival Music List Event Header indicates whether permission and/or transfer are allowed for each event. Permission forms can be found at wsmamusic.org/permissions. 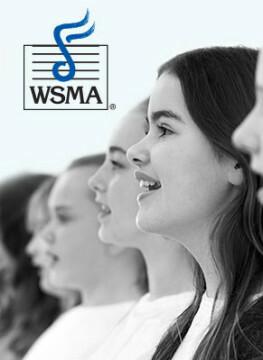 In events indicating that permission is allowed, teachers must submit a Permission Request in order to perform music not included on the current WSMA Festival Music List. All permission requests are submitted online. Permission requests must be received no later than six (6) weeks prior to the festival. A permission approval letter will be sent to the teacher to attach to the adjudicator’s copy of the music. The letter must be attached for the performer to receive a rating. It is possible to submit a request to perform a different, comparable edition of any selection on the current WSMA Festival Music List (even those events marked No Permission). All alternate edition requests are submitted online. Alternate edition requests must be received no later than six (6) weeks prior to the festival. An alternate edition approval letter will be sent to the teacher to attach to the adjudicator’s copy of the music. The letter must be attached for the performer to receive a rating. Music from the current WSMA Festival Music List may be used in events designated as Transfer Allowed. It is not necessary to send transferred titles to WSMA for permission. Event transfers are completed online during the event registration. Exception: Music from any of the 6000 events may not be transferred to other event numbers. All original compositions must be submitted to WSMA for permission. Original compositions written by currently enrolled students that meet eligibility requirements (see section III) may be submitted for permission in all WSMA festival events, including those designated as No Permission or Transfer. All other original compositions or arrangements may only be submitted for permission in events designated as Permission Allowed.